To be a Prince, in the Italian Renaissance is a brave and incessant struggle to conquer countrysides and fortify towns, but also to win the confidence and favours of nobles and common people: build up Cathedrals and Universities, enlarge Markets, adorne your cities but also increase your influence in all the power's spheres, conquer not only the regions, but also the men: they can help you to become the real Prince! On the face of it this is just a card game where you have to collect colour sets, but this game has some clever things going on that make it something a little more out of the ordinary. Each turn, you get 5 gold and 4 cards. two of these cards you must discard, but these discards are then combined from each player and the sets auctioned off. 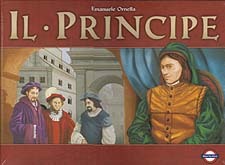 The winner of the bid becomes the Il Principe and can immediately use cards in their hand to develop a city, one of four displayed on the table. The cards used to develop are city are not discarded, however, but placed face up in front of you. Once all the card sets have been auctioned, the next phase begins where each player can either develop a city or lay down as many cards of a single colour in front of them, adding to the cards already there. In the next phase, players check the coloured sets in front of them in colour order. the player with the most of a colour gets a Major role card and the 2nd most gets a minor role card. Each role has a special ability. If players are tied, the role is then auctioned. However, if you gain a major role, you must turn over half of the cards of the colour used to gain that role, but the player getting the minor role doesnt turn any cards over. Gaining a role has two benefits. Firstly you get to use its special ability, such as gain a victory point. Then, as other players develop a city, if your role matches the colour of any of the cards used to develop that city you gain 2 VP for a Major role or 1VP for a minor role, whilst the player developing the city just gets the VP value for that city but can also play an influence marker in an area adjacent to that city. this influence is used to gain VP at the final scoring. As you can see, there are lots of nice, clever things going on throughout this game, and it is a pleasure to play.